OXFORD, Miss. 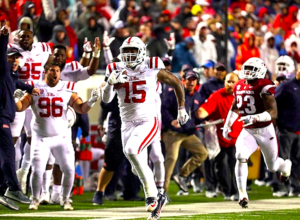 — The college football world is quite familiar with the “NWO” crew at Ole Miss. The “Nasty Wide Outs,” as the Rebels’ wide receivers are nicknamed, are routinely featured on the weekly highlight shows, but this talented group is not the only weapon in the Rebels’ offensive arsenal. There is also the “NWOWF.” What is that, you ask? It stands for “Nasty Wide Outs without Fanfare” and refers to the tight ends on the Ole Miss team. Dawson Knox and Octavious Cooley, tight ends and members of our newly-named “NWOWF,” may not have the name recognition as their brethren on the outside of the formation, but they do have something those guys don’t have – a higher yards per catch average. Although Cooley has grabbed just two receptions thus far this season, the junior from Laurel has made the most of them by racking up 85 yards–for a 42.5-yard average per catch. Knox has been productive as well. The Brentwood, Tenn., product has caught seven passes and amassed 166 yards, an average of 23.7 yards per reception. As for the “Nasty Wide Outs,” D.K. Metcalf leads the way with a 21.8-yard per catch average. Unfortunately, that number will remain the same as Metcalf was lost for the season with a neck injury last week at Arkansas. Cooley and Knox are not jealous of their teammates—rather, they are happy to contribute any way they can. Last week, the pair occupied the middle of the Razorback defense and that allowed the outside receivers a chance to excel as Ole Miss racked up 387 yards through the air. “They (Dawson and Cooley) helped us out tremendously last week, and it was just a matter of time,” wide receiver A.J. Brown said earlier this week. In the 37-33 win at Arkansas, both tight ends stepped up, making arguably the two biggest offensive plays for the Rebels. During the game-winning, 97-yard touchdown drive, Knox lined up to the left, faked inside and cut to the boundary where Jordan Ta’amu found him. 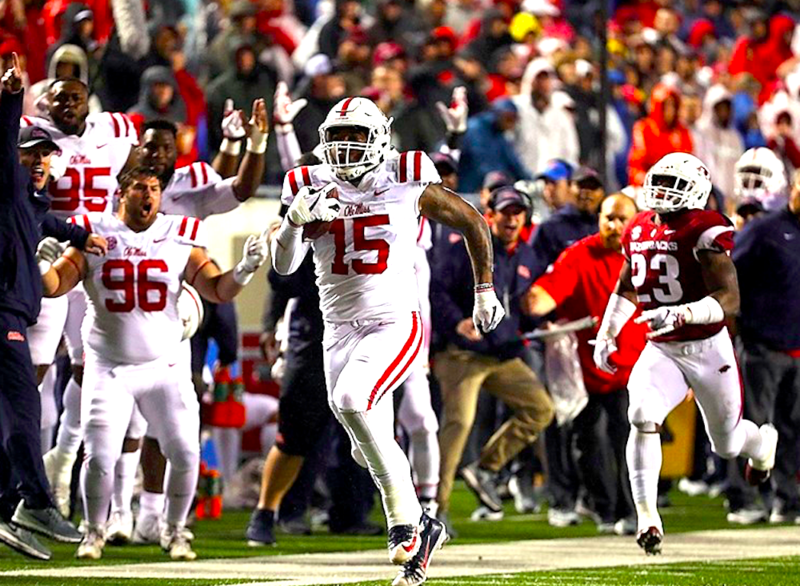 Knox stepped inside a DaMarkus Lodge block and rumbled down the sideline for 48 yards to put Ole Miss in scoring position for the game-winning touchdown. In the third quarter, Cooley made his presence felt. 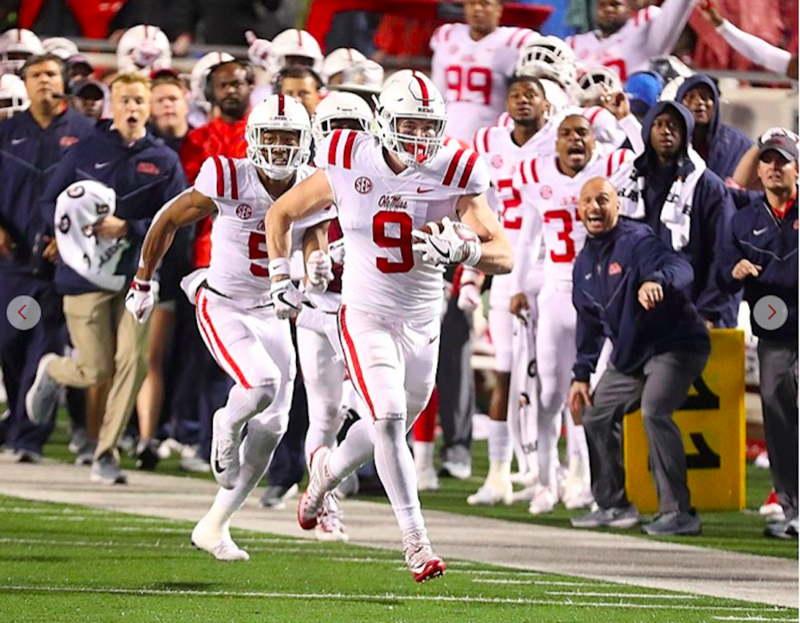 Trailing 30-17 and facing a third-and-11 at its own 34, Ole Miss needed a big play. 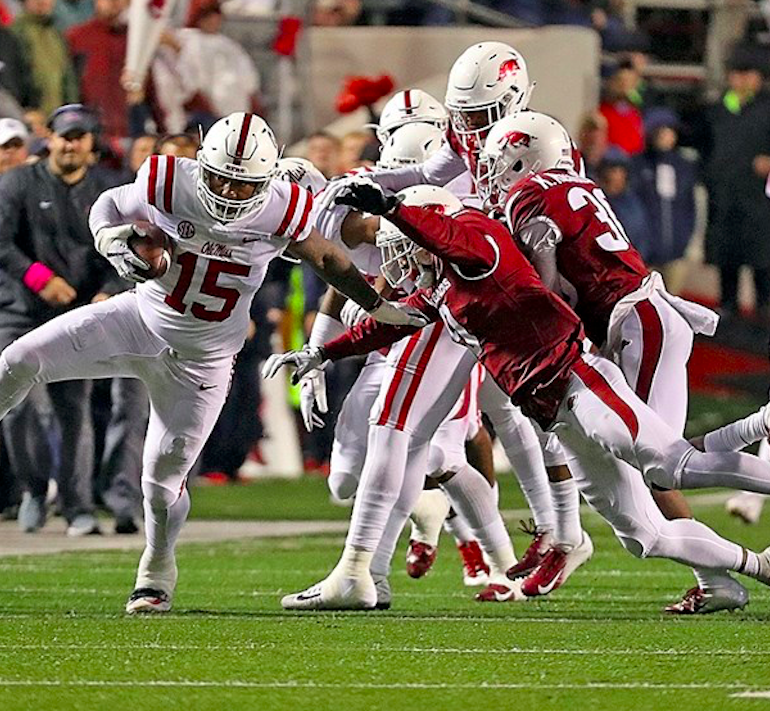 Ta’amu found Cooley who then split a couple of Razorback defenders, and 66 yards later the Rebels had closed the gap to 30-24 to put them in striking range of the fourth-quarter comeback. Harris was not the only Ole Miss coach who knew what the Rebels’ tight ends were capable of showing. Head coach Matt Luke spoke about the play of Knox and Cooley. “We know they are talented and we know they have the ability. It just kind of showed up big in this last game because they made big plays that helped us win the game,” Luke said. To complement the passing game, the Rebels ran for 224 in the win over the Hogs. That is serious offensive balance. As serious as the tight ends were against Arkansas, there is still a light side to them. In the preseason, Knox spoke, albeit tongue in cheek, about the wide receivers in a video which appeared on Ole Miss Football’s twitter. He tweeted and asked why he was not an honorary member of the NWO. When the NWO were asked who they thought tweeted that question, they laughed and knew exactly who it was. As for Knox, he responded in a diplomatic way about his request to join the group. “First of all, this was just to mess with the receivers. I was not being serious; I do not want to be a part of NWO, because the tight ends have our own special thing going,” Knox quipped. “They can have their stuff where they don’t have to block or anything, but just to clear the air, I was messing with the other guys,” he added, smiling. The “NWOWF” certainly messed with the Razorbacks. This week, they hope to mess with Auburn. Ole Miss and Auburn kick off at 11:00 a.m. (CT) Saturday in Oxford at Vaught-Hemingway Stadium. The game will be televised on ESPN.